The Conference in Lockum-2018: "The Church is an intermediary in the Russian-Ukrainian conflict"
Which role is the church playing in solving the conflict between Russia and the Ukraine, and which one should it play? That’s the issue the Conference that took place in the Evangelical Academy in Loccum (Germany) was trying to address. More than 10000 of civil and military victims, thousands of the wounded and traumatized, more than 3 mln. refugees – that’s the outcome of the conflict that started in 2014. What solutions may the church offer in this situation? The representatives of Russian and Ukrainian churches, German theologians and the representatives of the European churches conference gathered together at the Conference in Loccum to dispute about the role the church should play in solving the conflict and what resume can we offer in order to secure peace and justice in the Ukraine in the future. The Conference, however, couldn’t give a decisive response to the issue. Though, all the participants were united in the following: a religious aspect is not the issue in the conflict between Russia and the Ukraine. Heiki Huttunen, General Secretary of the European churches conference, said «The conflict is not of religious character, but the church could still offer its solution». Eduard Khegay, United Methodist Church Bishop in Eurasia, is doubtless about the fact that some issues can be solved by politicians only. As for the church, its role is to function as a mediator in disputes and prayer support between the two parties of the conflict. Priests, however, count upon the local churches and the small steps towards the peace. «We should develop the theology, which would be precise about the idea – there is nothing spiritual in killing one another». Bishop’s dream is that the theologians of a caliber like Dietrich Bonhoeffer and Karl Barth would come onto the stage. «People don’t need utopias and mere talks about peace, they need practical help», says Konstantin Sigov (Kiev), the publisher, philosopher and specialist in religious studies stakes on civil society local projects. German human rights organizations, that are actively present in the conflict area, claim about their close partnership with the Ukrainian government and non-government organizations. Berlin Union «German Russian Exchange» and Union «Kurwe Wustrow» (Lower Saxony) help Ukrainian non-government organizations to state the violation of human rights in Donbass. The Mennonite Central Committee works with the conflict victims and forced refugees. The help includes, in particular, instructing the sufferers by the experienced trainers from Bosnia, the former hotspot of a civilian and political conflict. Thus, following the small steps practice, mentioned by the United Methodist Bishop Eduard Khegay, a major issue is being solved. 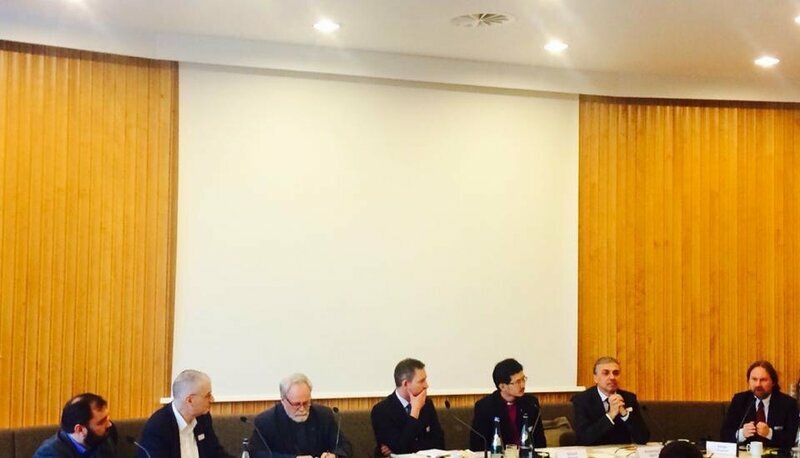 The Loccum Conference disputed on the Berlin Memorandum «New ways of security – the peaceful way in Europe», which was issued in the year of the Church reformation anniversary. This document calls upon a new look on the issues of security in Europe, taking into consideration also Russia’s point of view. This Memorandum resulted in hot disputes. «Loccum shows that we’ve made this issue central for a reason. Here we had a bunch of bright and experienced interlocutors, who shared their important and newly uttered points of view for the Ukrainian issue», says Chair of Germany Evangelical churches union Renke Brahms.